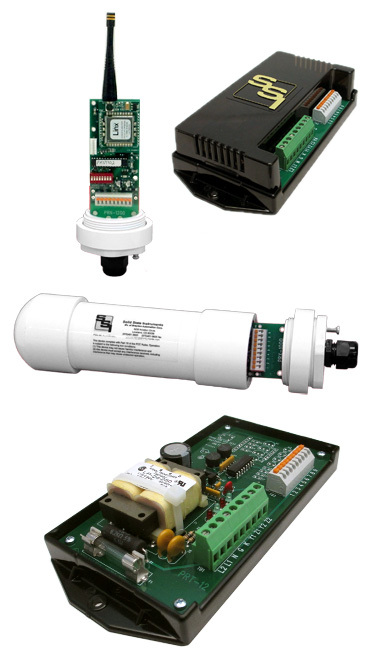 The PRL-1200C wireless pulse link is primarily a point-to-point system with one transmitter and one receiver for short-hop pulse applications like parking lots, fields, roads, railroad tracks or anywhere where it is difficult to get a KYZ pulse from the meter. Using Frequency Hopping Spread Spectrum (FHSS) technology allows excellent reliability and rejection of any other noise sources. There are 6 selectable channels. Each channel incorporates 50 of the 64 possible frequencies within the 900 MHz band. The same channel is selected on both the transmitter and receiver. Other PRL-1200 systems within the same radio airspace (~2-4 mile radius) will need to be assigned a different channel number. The Transmitter and Receiver are “paired” such that the Receiver will only accept meter pulse data from its specified Transmitter. The PRL-1200C can transmit either 2 Form C (3-wire) pulses or 4 Form A (2-Wire) pulses in one of two operating modes. In continuous mode, transmissions occur continuously about 10 times a second. Approximately 5 pulses per second (Form C) while 2-3 Form A pulses are possible, which is adequate for most pulse applications. Continuous mode is designed to make the output pulses mirror the input pulse to the greatest extent possible. In Delayed Mode, a transmission is sent once every 10 seconds with the number of pulses which have been received by the transmitter in the last 10 seconds. The receiver then re-creates the pulses over the next 10 seconds. In this mode, pulses are always delayed by 10 seconds, and additional error-checking and transmission acknowledgement are used for high accuracy. 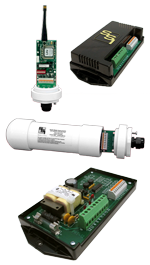 The PRL-1200C Wireless Pulse Link system consists of one PRT-1200C Transmitter and one PRR-1200C Receiver. The system operates in the 900MHz band and is FCC pre-certified, thus allowing unlicensed operation by the user. The PRL-1200C will transmit pulses up to 5,000 to feet in a line-of-sight (LOS) configuration. Distances vary with the terrain, obstacles and greater elevation above the ground. The PRT-1200C Pulse Radio Transmitter unit is made up of two parts: The PRT-12 Transmitter Base unit and the PRNT-1200C Transmitter Radio/Antenna unit which contains the radio transceiver and the antenna. The PRT-12 Base has a built-in low voltage transformer-isolated power supply generating a +13VDC sense (wetting) voltage. The sense voltage is connected to pulse sending devices, typically an electric meter’s KYZ pulse initiator. Each time a pulse is received by the PRNT-1200C, it validates the pulse width and transmits the pulse to the Receiver. Propagation delay is very short so the pulse output at the Receiver closely resembles the pulse widths received from the meter. The PRT-1200C can be operated using 120V or 277V AC line power or a +12VDC voltage source like SSI’s SPS-1 solar power supply. The PRR-1200C can be configured as 2 Form C or 4 Form A output channels and acts as the system’s Receiver. The PRR-1200C consists of a PRR-12 Receiver Base Unit where all connections are made and a PRNR-1200C Receiver Radio/Antenna unit which contains the radio transceiver and antenna. The PRNR-1200C is intended to be mounted outdoors, in direct line-of-sight with the PRNT-1200C transmitter radio/antenna unit and should not be obstructed by trees, buildings or other objects. Each time a pulse is received from the PRT-1200C, the Receiver validates this pulse and outputs it’s respective output channel. An encoded FHSS communication scheme is used to ensure the accurate number of pulses are sent and received. The PRR-1200C consumes extremely low power and can be operated using 120V or 277V AC line power or a +12VDC voltage source. The pulse rate is up to 4pps (Form C). *Both the Transmitter and Receiver units are capable of operating on supply voltages of 120, 208-277VAC, as well as +125VDC, +12VDC, and +15 to +48VDC by employing the special SSI power supply options. Input Wetting Voltage to Meter: +13VDC wetting voltage generated by the PRT-12 Transmitte Base unit. Total propagation time up to 20mS.